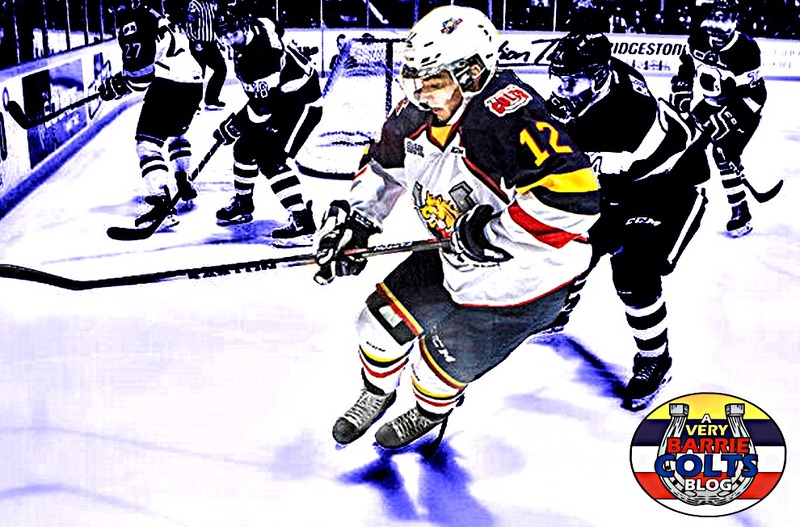 A Very Barrie Colts Weekend Recap/News (Nov 6th-9th) #OHL - Very Barrie Colts | A website covering the Barrie Colts of the OHL. The Barrie Colts went 2-0 over this weekend after a win over the Wolves in Sudbury on Friday and a win over the Greyhounds in Sault Ste. Marie on Saturday. The wins would give the Colts a 3 game winning streak and improve their record to 7-3-0-0 in the last 10 games. Barrie currently sits in top place in the Central Division with a 2 point lead over the Mississauga Steelheads with 2 games in hand on them. This weekend was the return of Barrie Colts captain Mike Webster who has missed the last couple games after an awkward landing awkwardly at the end of October. In the 2 games over the weekend Mike got 12 shots on goal. The Colts 4-2 win over Sudbury on Friday was their second win of the season over the Wolves. Though the Colts we unable to score a goal on 9 power play chances, they were still able to use it to maintain momentum through the game and it helped them get 49 shots on goal. Barrie killed off all 6 penalties as well which has been a huge strength of theirs all season. Nattinen scored the winning goal which was his 6th on the season while Justin Scott would get the insurance goal not long after to help secure the win. Mackenzie Blackwood would make 36 saves on 38 shots faced. Kevin Labanc got 2 assists in the game. Rasmus Andersson was also credited with 2 assists and was a +4 in the game. Another game where the Colts would generate over 40 shots in a game, Barrie managed to beat the Hounds by a score of 4-1. Cordell James scored the game winner early in the second period. The goal was his 7th on the season. James is already 2 goals behind his career high of 9 goals from last season and 10 point away from his highest point total. Incredible when you consider that he is only 17 games into the season. Captain Mike Webster would score a goal, finished the game with a +1 and generated 6 shots on goal. Have we mentioned how great it is to have the captain back? Kevin Labanc would also score 2 goals on the game which would bring his total to 8 on the season. His 24 points this season has him only 1 point behind Andrew Mangiapane who leads the team in points with 25. Mac Blackwood saved 34 shots on 35 faced. He continues to be a work horse for the team. It is nice to see though that though he is still getting a lot of pucks on him, the team is taking less penalties and are finding a way to generate more shots the other way. We have been successful when being out shot heavily so imagine how well we can do if we maintain this kind of offensive success? The Colts continued their success short handed killing off all 5 penalties and managed to go 1 for 2 on the man advantage. Brendan Lemieux has 1 more game remaining on his 10 game suspension. The Colts play at home this Saturday and head to North Bay on the Sunday. Lemieux is eligible to return for the Sunday game which should help the team with production and on the man advantage. Though getting Webster back was a relief, Kody Gagnon remains out of the lineup since last week with an "upper body injury". It was reported on Twitter by Gene Pereira that it will still likely be "a few weeks" until he is able to return. News isn't as good on blue liner Kody Gagnon (upper body), who is "still a few weeks away" from returning to the lineup. Barrie Colts goalie Ruan Badenhorst was named the 'OHL Central Division Academic Player of the Month for October' last Friday. VS Saginaw Spirit on Saturday, November the 14th at 7:30pm. @ North Bay Battalion on Sunday, November 15th at 2:00pm. Chicks Dig Hockey and I have started a series called 'Who's your Daddy?' 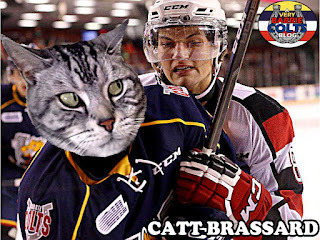 which is a series where we will take an OHL player past or present who had a father who played in the NHL. If you missed the first one we took a look at The Hawerchuks which can be seen here. Next up will be 'The Lemieuxs' which will be up on Wednesday. We also added Matt Brassard to our 'Colt's as Cats' post after he was voted for in a Twitter poll we held last week. Matt, and the rest of the litter can be seen here.